Shirts With Random Triangles: Alabama Adds Former Ole Miss Graduate Transfer Kicker Andy Pappanastos To 2016 Roster. Alabama Adds Former Ole Miss Graduate Transfer Kicker Andy Pappanastos To 2016 Roster. Andy Pappanastos. Image via Red Cup Rebellion. From the "What's mine is mine, what's yours is mine" department comes word that Alabama has picked up a graduate transfer from Ole Miss just in time for the 2016 season. 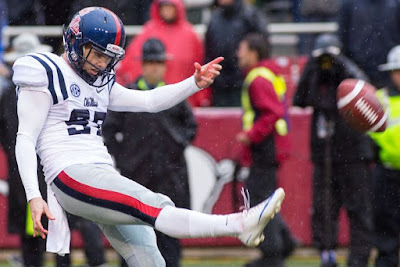 Ole Miss kicker Andy Pappanastos announced on Tuesday that he would transfer to the University of Alabama. Pappanastos was granted his release from scholarship by Ole Miss in January. He spent most of his three seasons in Oxford as either as a grayshirt or redshirt. He made eight point-after touchdowns, but missed on his only field goal attempt. Pappanastos enroll for graduate school at Alabama, meaning he will eligible to play for the 2016 season.